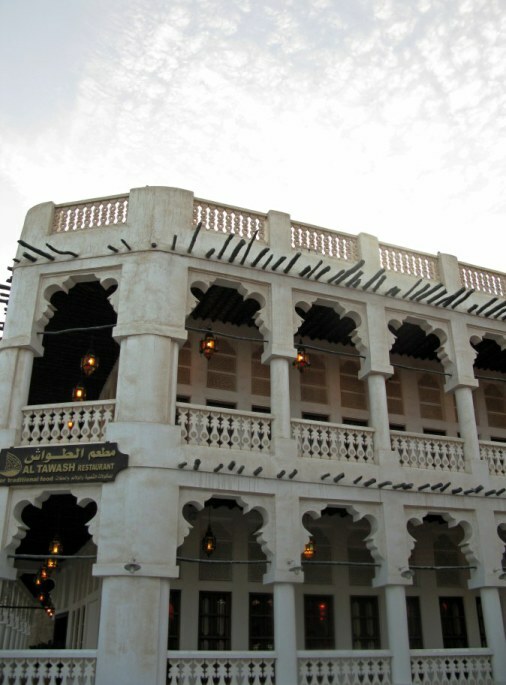 New, but capturing the best of former traditional architecture, Souk Waqif in Doha offers a mix of antique and new, utilitarian and decorative, fine dining and character. 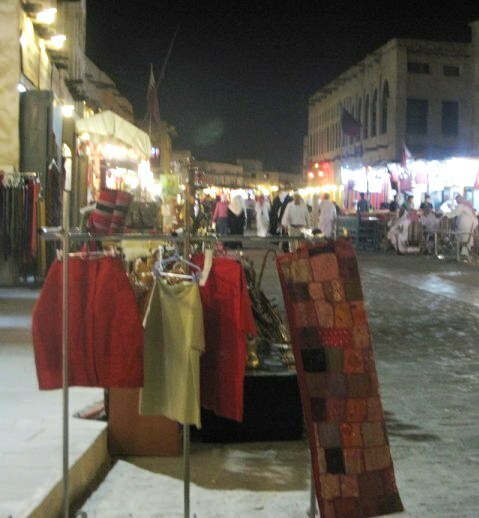 Working in Qatar I spent more time 80km (50 miles) north in Ras Laffan Industrial City than in Doha – and on the two occasions I managed to get to the Doha Old Souk - Souq Waqif - which lies between Al Souk and Souk Waqif streets, it was Friday, the Holy Day. As a consequence, most of the shops were closed. The falcons in the Falcon Souk were unfortunately absent as well, and I would love to go back again when it is in full trade and spend time with these grand birds at the falcon market. A nearby intersection was supervised from under the shaded stand of this traffic policemen as cars and trucks pulled into a busy parking lot. 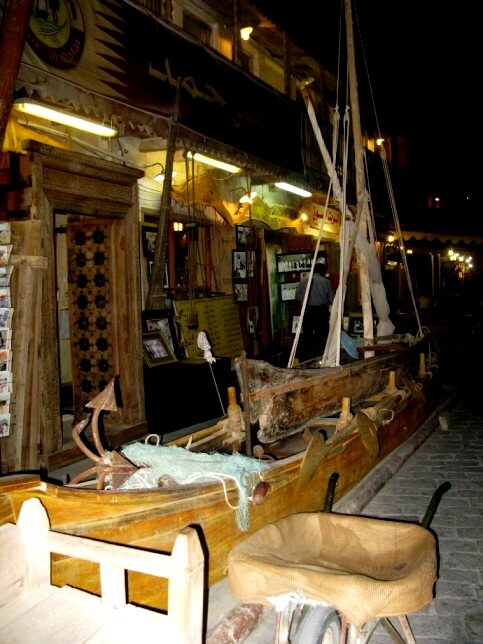 The first time there, the cab duly arrived back at an appointed time and particular entrance of the Doha Old Souk to collect us. The second time I had been assured there were ‘lots of taxis’, but being a Friday, there were not. The wait to flag one down nearly melted me, even though it was late evening. A worthwhile note: finding a taxi in Doha is a bit problematic if you are not right in the centre, so it is worthwhile making a time for collection or arranging to call a particular taxi or hotel car. The trick is to recognize the entrance at which you were dropped and to which you have to get back! It’s helpful to jot down the name of a nearby shop so you can get directed to it if you find yourself at the wrong entrance. He who asks will not be lost. You will not diminish yourself by asking for directions - and it might well be a necessity to do so! 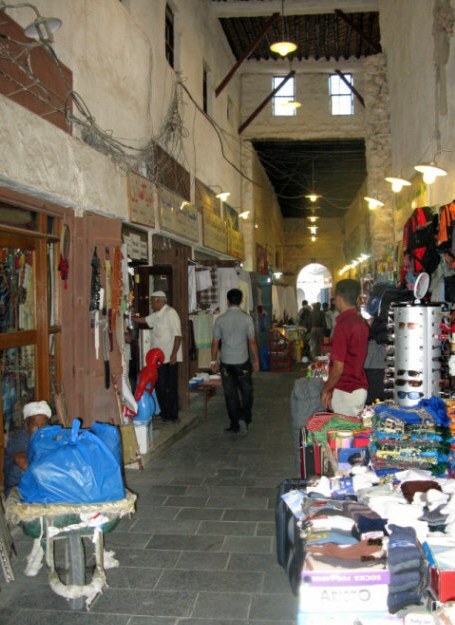 The Doha Old Souk has been rebuilt to replace what reputedly was an extremely unprepossessing earlier version. 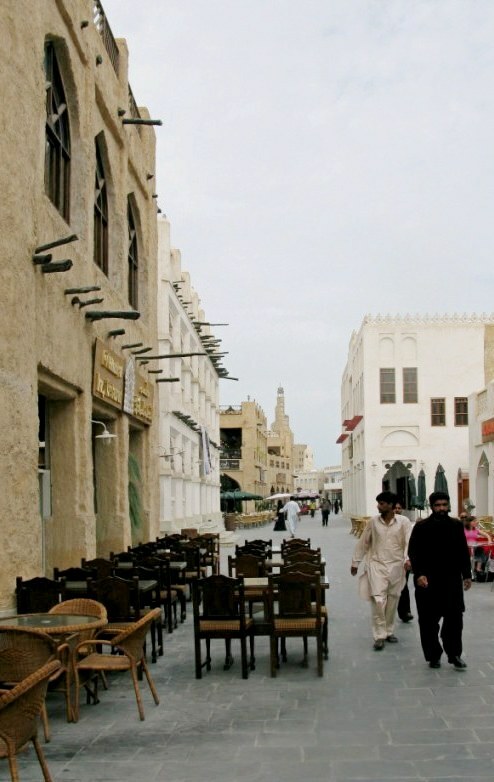 The maze of narrow alleys internal courtyards, rooftop restaurants and galleries come alive in the evening, and members of the large expatriate community and tourists mingle with Qataris busy making household purchases. 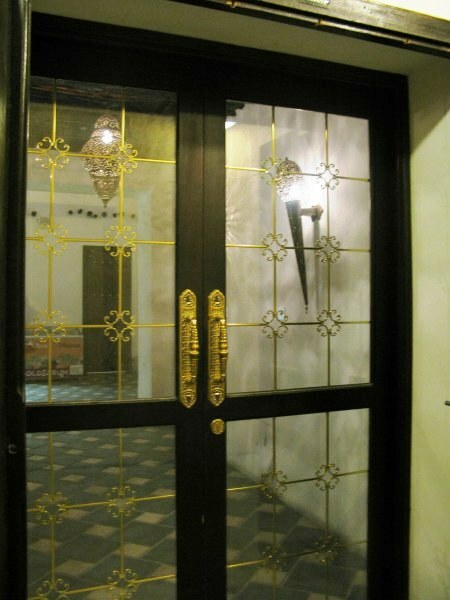 There are beautiful doorways off carved and patterned wood …. …or glass and brass, luring you inward. 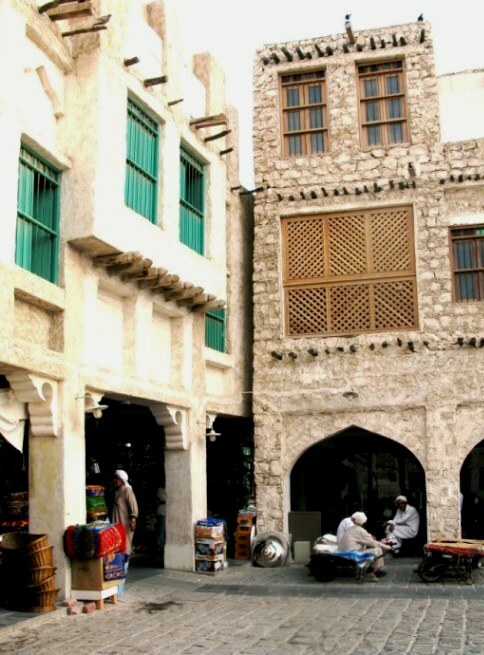 The architecture of Souq Waqif is a lovely melding of Moorish and traditional Arabic. The pleasing lines are clean, elegant, and functional - with roof terraces and airy windows and balconies. 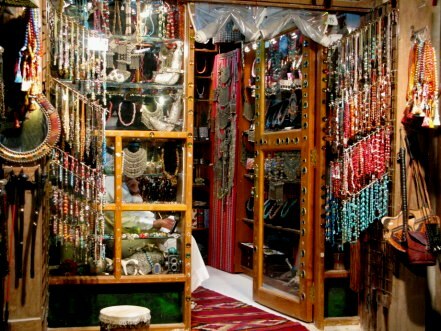 In its coolness and variety of things to captivate your imagination, the Doha Old Souk is a pleasant place to browse. The electrical wiring gathered loosely in a jumble on the walls (as you can see on the top left of this photo) – reminded me rather of the same effect in Cuba. There are lots of men with wheelbarrows, like this one, with the man patiently waiting to deliver his goods internally. The gold section of Doha Old Souk is usually well attended - even on a Friday. Here, I reviewed the pearls – once the staple economy before natural gas and petroleum gave the country incredible wealth. Further along I lingered in the spice market where even from the few open shops, the air was heavy with scents – both familiar and exotically different. 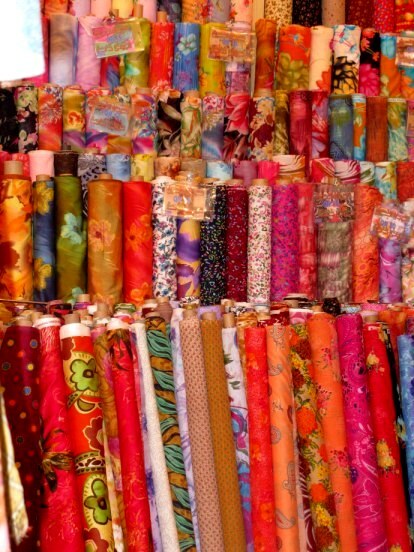 In the silk market, ladies in black abayat and headscarves combed through a range of brilliantly coloured materials – an interesting chromatic contrast. There were stalls of perfume – heady, musky, exotic Ittar – or Attara, made from naturally distilled oils extracted from flowers, wood and herbs – and aged for up to 10 years– usually in sandalwood. The resulting perfumes are highly concentrated and due to their purity, a little goes a long way. They also don’t deteriorate the way that western perfumes can do. 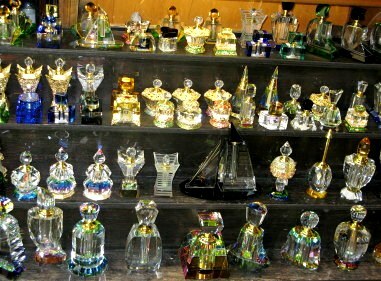 The cut crystal perfume bottles – or Itardans - that are on sale to hold the perfumes of Doha are as exotic as the scent. Traditionally, these were filled with perfume and often given as gifts by the nobility to departing guests. However, I lingered longest at the shops with real regional antiques (as distinct from reproduction). 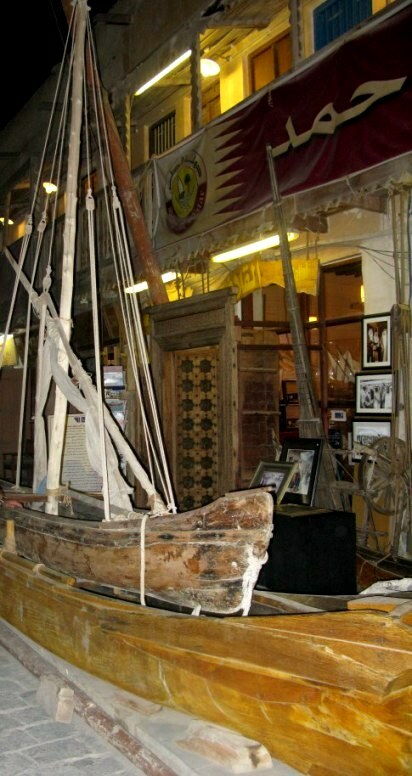 Here there were maps and diaries, old lamps and all sorts of unrelated things - even this wooden boat. There are some other 'Eastern' antiques not necessarily from the region but not lacking in quality and interest. 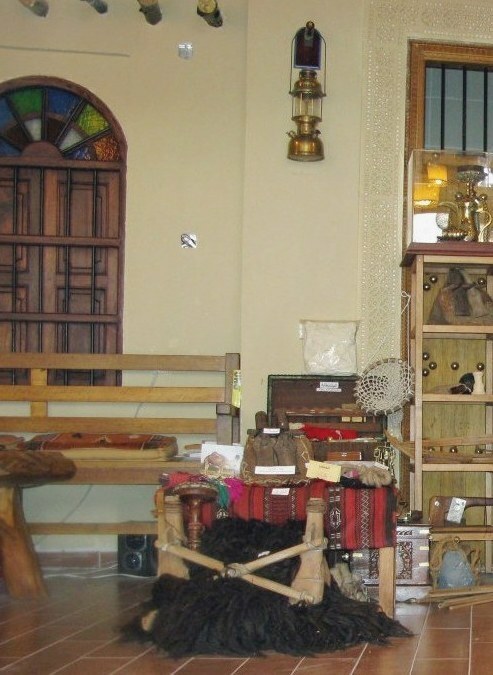 It is possible to buy some things made locally – but you have to look for them, and some are being made before your watchful gaze in the shops of the Old Souk, as the wonderful pile of wood shavings demonstrated. …or perhaps a saddle for your camel. The shop of the music maker was closed on my first visit, but I went straight there on the second, and managed to purchase for a musician friend a small traditional drum of goatskin, with goat hair sides, and a larger round one, similar to an Irish Bodrum. 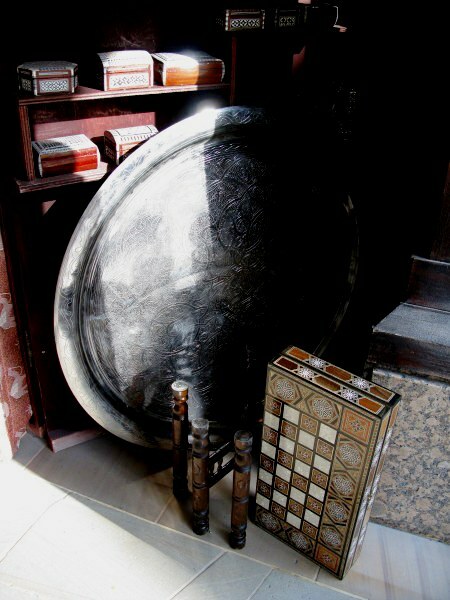 These traditional drums were a bit large to be transported back in my luggage but are in themselves works of art. The drums stacked together formed lovely patterns. 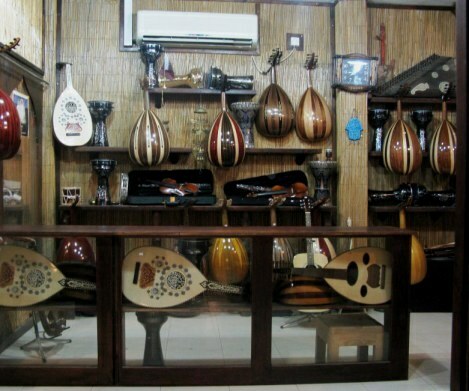 These beautifully crafted Oud were being sound tested by a musical tourist of some talent. I lingered – enjoying the music in the heavy warm air of evening. 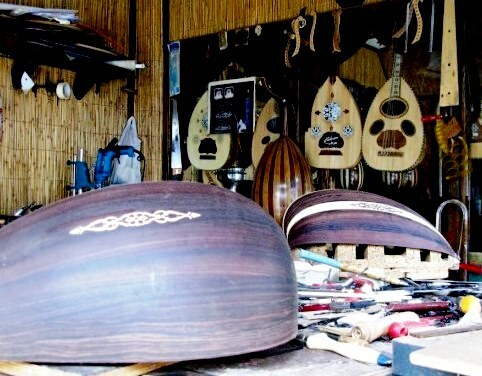 The oud is similar to a lute, but a smaller neck and no frets. It sounds very similar to a zither – and they are lovely just as pieces of art, let alone as instruments. 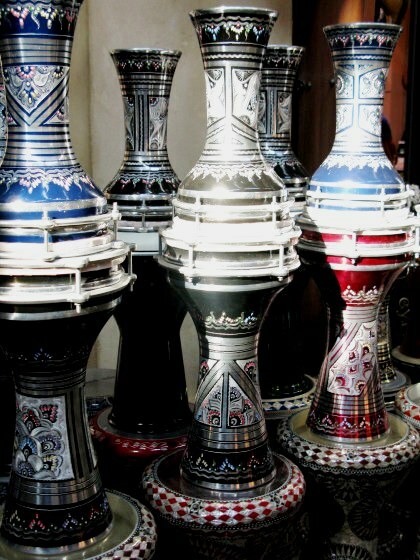 Here is a clip of Oud music. 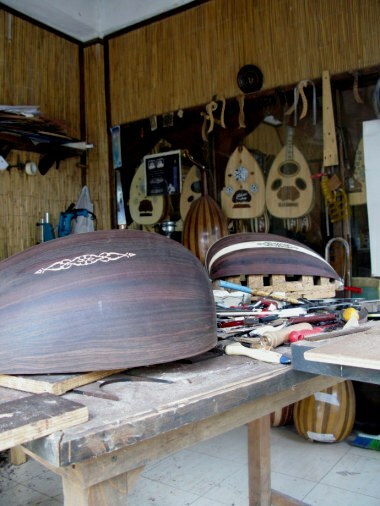 This interesting video explains how to select the wood for the Oud and how the price has eescalated through Chinese purchases of each level of quality, leaving the wood fir Ouds to become even more precious. 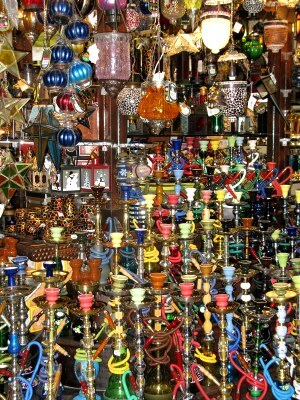 In the region, maqhah, or coffeehouses, are gathering places for the convivial smoking of tobacco with these hubble bubble pipes (known elsewhere as hookah). Tobacco smoke is passed through a small bowl of water to purify and cool it. 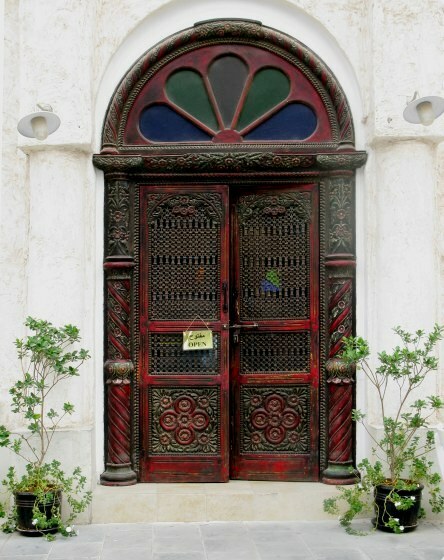 The source of the tradition is variably attributed to India and to China, but has become a hallmark of Arab community life. 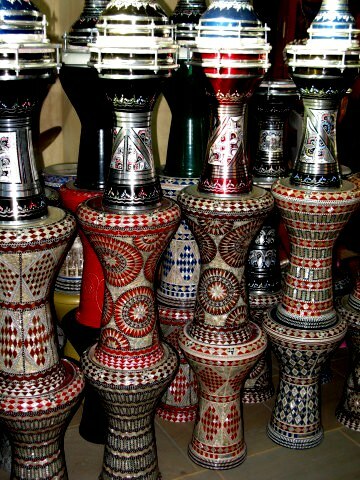 The shisha is prepared by placing the charcoal tray on the pipe with the clay bowl (with attached grommet) on top. The bowl is then covered with a small sheet of aluminium foil which is pricked to allow the air to flow through. White hot charcoal is then placed on the outside of the bowl and the hose attached to the grommet. The trick is to make gentle, long draws through the pipe so the air is drawn evenly through the tobacco without burning. 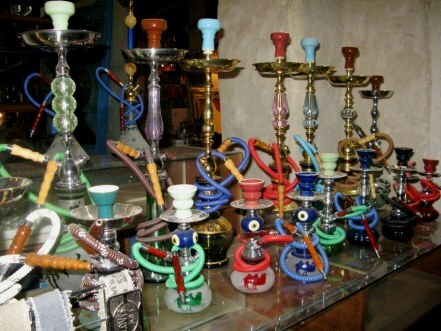 Given so much preparation, and the necessity to keep pipes clean to stop unpleasant build up of flavours, you can understand why shisha smoking with friends at cafes is so popular, as here there are always pipes ready at a whim. 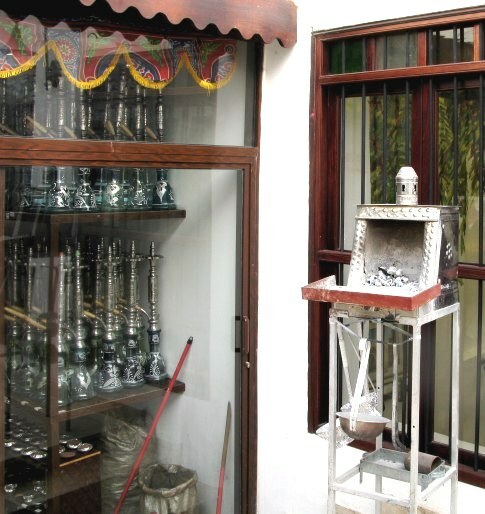 On one rooftop terrace this ornate brazier kept coals ready to replenish those in the many pipes in use on the restaurant roof terrace, or at the outside tables in the souk walkway. It was Ramadan, so until sunset, the restaurants were empty. But later they quickly filled with visitors and locals alike. 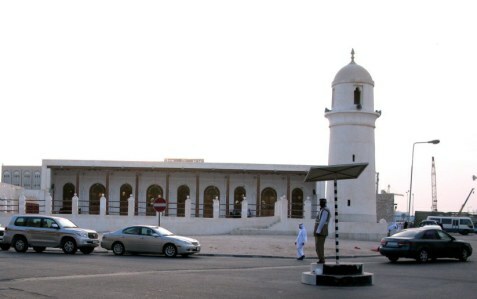 The squares and walkways of the Doha Old Souk became filled with couples, families, and groups of men gathered together to smoke and chat. The picture would not have been complete without men talking on their mobile phones.It seems to be a permanent characteristic and one wonders how a person can possibly sustain a conversation for such interminable periods. 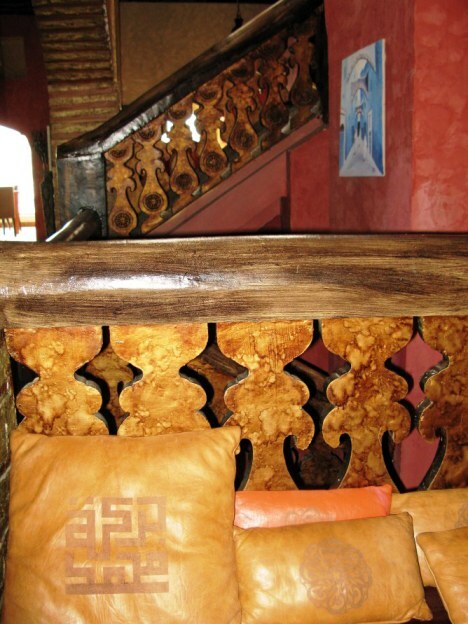 Inside the restaurants are beautiful woods, leather furnishings – and a general feeling of luxury. Ignoring the growing crowds, this donkey waited patiently for young riders – or tourists. 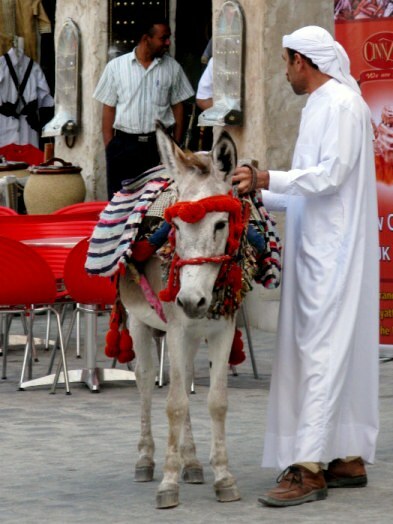 In the setting of Doha’s recreated 'Old' Souk, the waiting donkey fit with the visitor’s concept of what a Doha Old Souk might be. 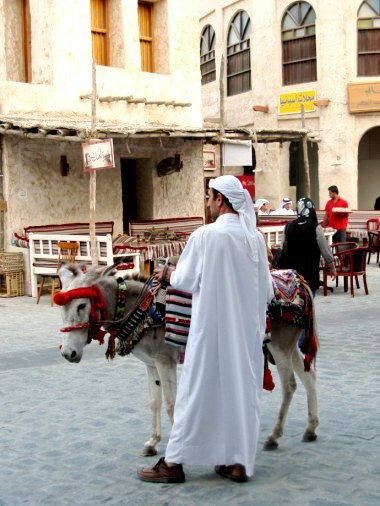 In the restaurants and shops of the Old Souk of Doha they adhere to this principal.